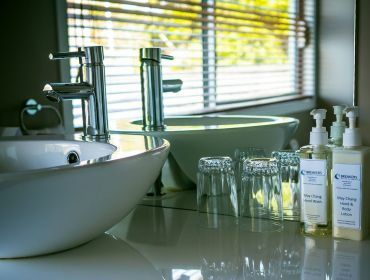 Upstairs in the main house with uninterrupted sea views - including from the ensuite bathroom! 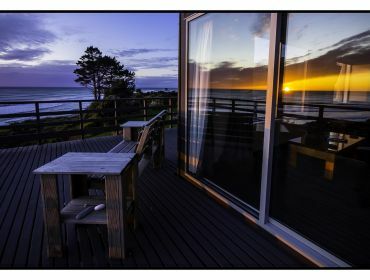 Decorated in warm colours with NZ native recycled furniture, you can lie in bed and watch the surf. 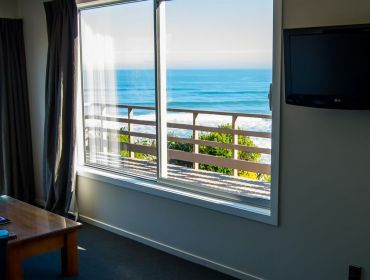 A comfortable sitting area is provided and makes the most of the fantastic views of our grounds, the beach and the mighty Tasman Sea. The room opens onto the balcony so no matter what the weather you can enjoy our beachfront location. Breakwater has a king bed and a leather sofa bed that converts to a king single bed for twin or triple occupancy. Rate is for two people. Additional charges apply for third person (maximum occupancy three people). Rates include breakfast.